A hearty bowl of ramen has the power to cure any hunger pangs, and warm even the coldest of moods. 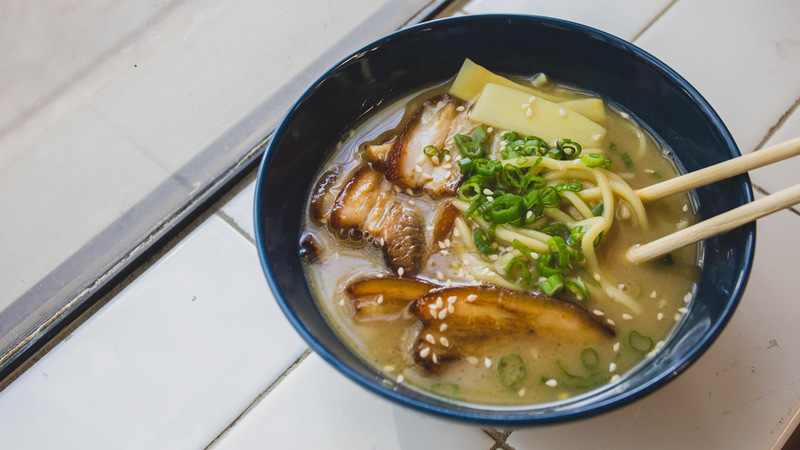 There will always be a place in my heart for the savory Japanese noodle dish, and for all the ramen lovers out there, you never forget your first 50-pound bowl. 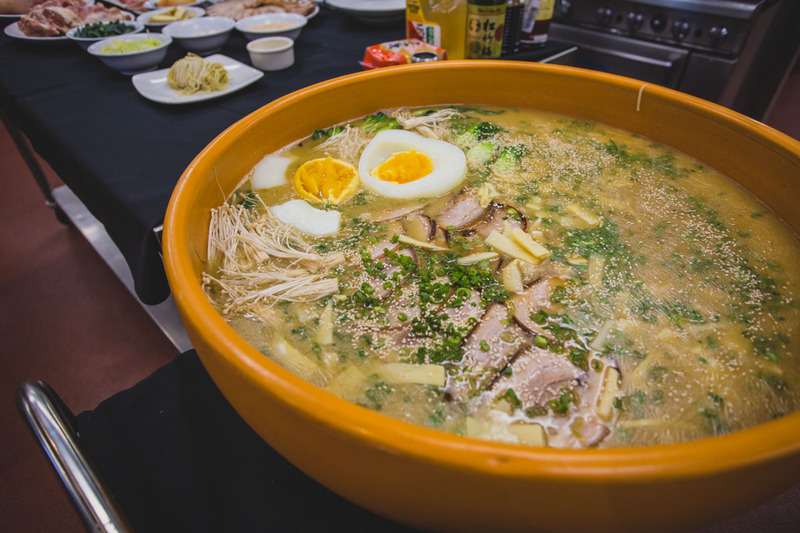 Yes, you read that right: A 50-pound ramen bowl. 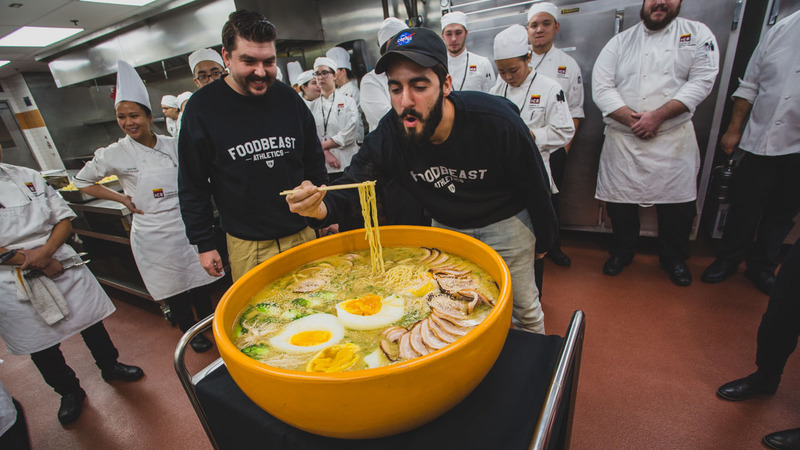 The Institute of Culinary Education in Pasadena, California, created a massive 50-pound bowl of ramen in celebration of Foodbeast hitting the 5 million follower milestone on Facebook. Inside the generous helping was more than 30 to 40 pounds of authentic ramen noodles and an ocean of tonkotsu broth made from pig trotters, pork fatback, and chicken bones. "In the actual broth, we char scallions, ginger, garlic, onions, and leeks," explained chef Leicel Ros, an instructor at the Institute who constructed the dish. "For an extra layer of earthiness and umami, we did whole mushrooms. We used shiitake mushrooms and button mushrooms." Flavors of the broth were developed for 24 hours prior to serving through an intricate process. To complete the colossal ramen bowl aesthetic, the dish was topped with an entire ostrich egg. "If you think about it, you're just cooking a giant egg that's the size equivalent to at least 24 chicken eggs," she laughed. "It's a very thick shell, so we boiled it in a large pot in rapidly boiling water from 50 minutes to an hour." The extravagant dish touched upon Chef Ros's passion of developing flavors meticulously with patience and care. "Honestly, there's a lot of love that goes into each component," she shared. "I think the magic happens when everything combines into one plate. With a project of this scale, Chef Ros had to be extra attentive to make sure every single step of the dish was done correctly and carefully. "Time is the most important ingredient that we have as chefs, and we can't buy time," she stated. "If there was anything we were low on, we can buy it back, but there's no replacement for time." 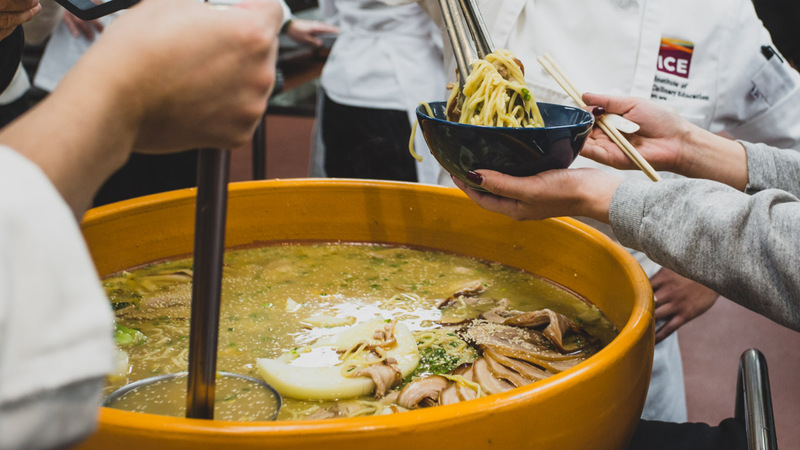 The bowl held enough broth, noodles, and protein to serve nearly 100 hungry people. While this unique experience was created specifically for Foodbeast, the Institute offers a plethora of experiences they can put together for you and your special occasions. If you're looking to book a food adventure of your own, check out the Institute's special event page and see what you can create with a love of food and some imagination.